watching a tiger all set to attack its prey, the poor deer. The scene was overwhelming, full of thrill and curiosity. Didn’t know what would happen next. Although I wanted to help the innocent deer but all I could do was wait and watch. The entire wild drama stretched for almost ten minutes and finally with sheer luck the deer had a narrow escape. I was really happy for the deer. Well, I am talking about a wildlife show on Sariska National Park, which I was watching on Discovery channel the other day. 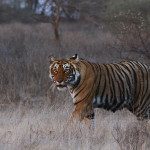 I liked the show very much and decided to embark on a wildlife journey in Sariska National Park in Rajasthan. After reaching the Sariska Tiger Haven hotel just outside the Sariska National Park at night, I was eagerly waiting for the sun to rise to begin the wildlife journey. Finally in the morning with hopes in my heart I along with the guide Dara went for morning wildlife safari. Sariska National Park is a Project Tiger Reserve sprawling over 800 sq km area encompassing hills, valleys, scrub-thorn arid forests, dry deciduous forests, rocks and grasses. 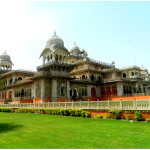 Located in the Alwar district of Rajasthan, the Park is a home to a variety of wildlife species. I along with my well trained guide Saurab ventured deep inside the forest in search of wildlife. With my binoculars I sighted some magnificent bird species and was elated. Other animals I saw were striped hyena, golden jackal, chital, sambhar, nilgai, four-horned antelope. 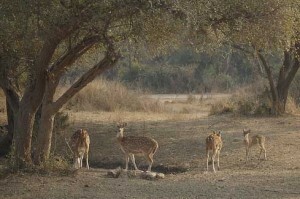 Langur, wild boar and chinkara. My safari was about to come to a close but my sore eyes were still awaiting the arrival of the jungle king. After a lot of struggle, all we got were the pugmarks of tiger. And now was the time to retrace our steps out of the jungle. With great memories of the wildlife I saw and without any complaints against the Park or its wildlife, I came back thinking ‘there is always a next time’. 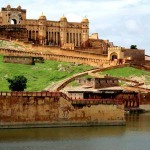 «Next Post Mount Abu – A Celestial Tryst With Nature!